Frasius wrote to the People's Party state central committee to encourage them to keep working for reform and specifically to try and attract the votes of immigrants from Germany. 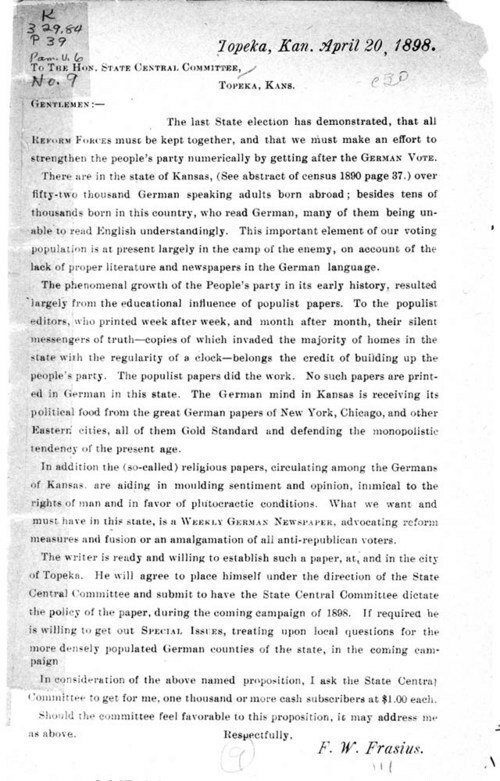 To accomplish this, he wanted the party to organize a weekly German newspaper so that Germans in Kansas had a source of information other than from German newspapers in eastern cities. Frasius wanted the state central committee to get him 1,000 cash subscribers at $1.00 for him to start this proposed newspaper.